Theodore Brown and his Spirograph invention. The earliest example of a 'video' disc to reach the market. The device was patented in the UK in 1907 by Theodore Brown. Its right to be regarded as a proto-video disc is based on simple principles: it is a flat disc, carrying moving picture images, that can be readily reproduced. The 10-inch disc, packed in a paper sleeve like those of 78rpm records, contained a spiral of 1,200 images which, at 16 fps would give a running time of 1.25 minutes. As well as the central hole for the spindle, a pin engaged with a second hole and the hand-cranked projector was driven by a system of gears that maintained synchronisation between the disc and the lens/light assembly. Brown sold his rights to the American-born but British-adopted entrepreneur Charles Urban, who marketed the system in 1915 in the USA (a projector is in the Smithsonian) and several hundred titles were offered. Discs were made by The Pictures Development Company of Toledo, Ohio. It made no apparent impression on the market. 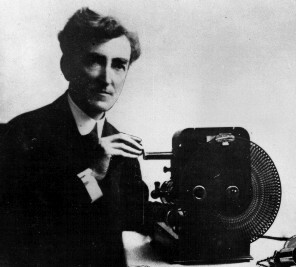 Theodore Brown (1870-1938) was editor of the Kinematograph and Lantern Weekly and a British inventor with numerous patents to his name. He also patented mechanical toys, games and puzzles, kaleidoscopes and advertising devices with changing pictures. His wife, Bessie Kate Brown (occupation described in 1907 as ‘Lady’), also shared credit for some of the patents. Indeed, in this instance, her name comes before his in the preamble.